Here at Hertel, we get a lot of technical questions about not only our waxes... but also, about general tuning techniques as well. We decided that it might be time to start answering these questions in a more "public" format, since we get these "in-frequently asked questions" so frequently. I have your Super Hot sauce, and have been using it for the last year. My question is, it seems to work well on the groomers at normal temps... i.e., in the 20 degree F range. But yesterday, we had fresh snow and low temps in the single digits to teens, and our skis seemed to be sticking. My kids skis had two days on their most recent waxes, and I had just one on mine. I was faster than them, but out-weighed them but a 150 lbs. My skis were definitely not as fast as they had been when the temps were in the 20's. We live in Montana, and I always hot wax... then, scrape and buff with a brillo pad. I've watched your videos, and do my best to duplicate the application. Should I have a Cold weather wax on top of, or below, the Hot Sauce...? The premise of all waxes, is that we don't actually ride on "snow" at all... but rather, a thin sheen of water that forms when a ski (or a snowboard) glides over the snow... and the friction of that glide, plus the weight of your body mass, melts the snow slightly, forming a thin water layer. This is what we are actually riding on, when we do snow sports. Waxes, in turn, repel water. Which is what creates the "glide" that we all know, and love. In extreme cold, however, this effect is less pronounced. The snow simply melts less underfoot, resulting in less water to glide on. The snow that does melt, re-freezes very quickly... usually, to your board. Which creates the drag that you experienced. And when the snow melts less, it becomes less lubricated by water, causing a much more abrasive running surface. A Brillo pad (or, any other highly abrasive buffing agent) will leave a surface that is essentially millions of little grooves, that will hold and trap water, and create undue drag on cold snow. When you are gliding over a "warmer" snow, these grooves help to move water along, and away from, the base... which creates a fast glide. But on "cold" snow, they actually trap water in the base, where it then re-freezes itself to your skis. Which is a perfect recipie for sticking. This "sticking" will usually happen at slower speeds, and especially when you're standing still. Getting off the chair lift, waiting for your buds (or kids) to drop in, or standing in a lift line will be prime times for "sticking" to happen. Generally speaking: The faster you're moving, the more friction you'll cause, the more water you'll create, and the faster you'll go. But at slow speeds, in cold conditions, all bets are off the table. The answer is to use a less abrasive buffing pad, combined with a harder wax. In your case, on that day, Racing 739 would have been a better choice. As for buffing... I personally use the "non-scratch" Scotch-Brite that's available at any grocery store. You'll know it, because it will be blue, instead of the usual "Scotch-Brite" green. Cork would have also been an excellent choice, under those conditions. My recommendation? Try both, and see for yourself. We also each have a set of powder skis, which we use in fresh snow conditions. What's your recommendation for wax on those skis? I use Race most often, as a hot-waxing "base prep"... as it's hardness allows me to scrape off, and brush out, the loose base "hairs", which leaves a smoother, cleaner structure. Then, I'll rub-on and buff whatever my "daily" wax is going to be, based on snow conditions. Hotsauce and Race do bond well together, and both bond extremely well to bases... but Race is better in terms of base-bonding, which lends itself extremely well to a "base prep" use. As far as choosing my "daily" wax goes: I choose the ideal wax, based on likely snow condtions that day, using the predicted air-temperature and humidity levels as my guide. Nobody can know what those conditions might be will be until either the day of your skiing trip... or, a few days beforehand (based on upcoming weather forecasts). So: If the weather forecast says that it's going to be over, say, 20 degrees, and sunny... or maybe even warm, cloudy, and a bit humid... then, I'll run a little Hotsauce over the Race base layer, using green Scotch-Brite to buff it out. This is essentially the warmer-condition, "moving water" recipe. If it's predicted to be cooler, windy, and drier? Then, I'll leave the Race as-is, and buff with blue non-scratch. This is the cold-condition, "polished base" treatment. I might even rub-on a little extra Race wax, if I'm using a board with deep structure... as a deep base structure will also tend to hold and trap water. A thicker wax application will "fill" the structure more, creating an even slipperier surface. What if I'm facing highly variable, unknown, or unpredictable conditions? In that case, I'll still run the Hotsauce over Race combo, but buff with the blue non-scratch. This will cover most of the "unknowns" that I might face on any given day. On a warm day, the base will glide all day long on the Hotsauce, and the snow itself will "structure" the wax. On a cold day, the smooth-buffed Hotsauce will work off fairly quickly, revealing the harder Race underneath. In either case, your base will feel noticably faster in just a couple of runs as the wax adjusts itself to whatever condition is prevalent. One thing that you didn't address in your letter, was what sort of structure you have in your skis. Structure and wax work together- and as such, having the "right structure" is just as important as choosing the "right wax". In Montana- where conditions get extremely cold and dry, I presume- you'll probably want a very shallow, fine-grained, tip-to-tip structure. In the spring- when conditions warm up- re-structure with a deep, coarse structure- preferably, with a cross-hatch pattern- to move water out from under the base more effectively. Cross-hatching is especially useful on snowboards, given their ample surface area. Finally: If the hot sauce is all temp... why the Spring Solution wax...? Spring Solution is different altogether. It is tailored to fit a snow condition, not a "temperature" per se. This condition being: Old, dirty, extremely wet (maybe even slushy), and pollen-crusted snow. Spring rejects water (just like Hotsauce does, but even moreso), but also goes a step further and rejects contaminants as well. Use Spring with a deep, well-defined base structure (to move all that water efficiently). And use it sparingly, as too much wax will actually clog the structure, which is self-defeating. You want an open, well-defined structure to move all that water. Brushing wax out with a brass brush is ideal in these conditions, to keep that structure open, and well-defined. Thanks, Jeff, for your letter! Here at Hertel, we love answering technical questions. 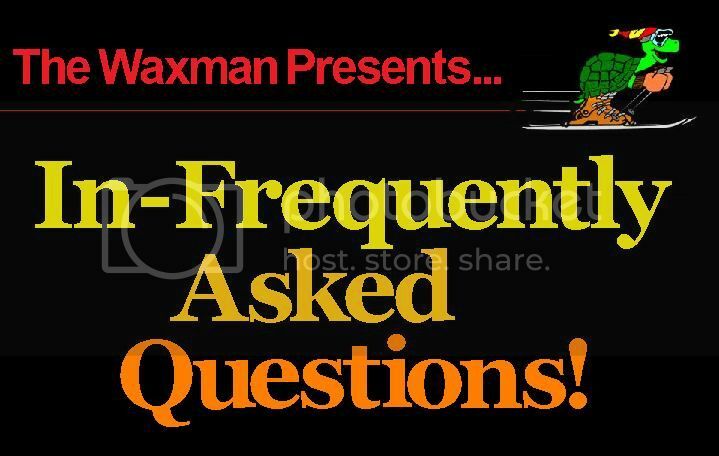 If you've got a question that you'd like answered, send it in to waxman@pacbell.net, and we'll get right on it...!